Introducing our silver F1 Bengal Tecspot Meraki of KotyKatz! The name “Meraki” means to do something with passion and soul which I thought was VERY fitting. As I steer my breeding program more towards Silver, Seal Lynx Point, and Silver Seal Lynx Point Bengals I really want to pull in the wild features of the Asian Leopard Cat. During the plan to work on these colors I made the decision that I needed a well bred, healthy, beautiful F1 Silver female. She is more than just another beautiful Bengal, she is part of the foundation of a great new line of cats! Leftover Thanksgiving turkey with Meraki. If you’d like to see Meroki’s pedigree, please click here. 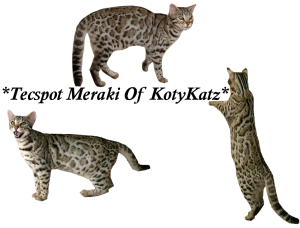 This entry was posted in Gallery, Reference Queens and tagged Bengal, Bengal Queen, F1, rosetted bengal cats, seal lynx bengal, silver bengal, silver bengal cat, silver seal lynx bengals. Bookmark the permalink. ← Beautiful Bengal babies ready for your home mid January! !